OADC has practice groups organized around key substantive areas of the law to provide practicing lawyers with current information relevant to the substantive area of law in which they practice. These practice groups include: commercial, construction, coverage, employment, government liability, new lawyers, product liability, professional liability, transportation, and trial practice. Practice groups offer continuing legal education at our annual convention and other events, host practice group meetings and networking opportunities, publish pertinent articles in our newsletter and more. 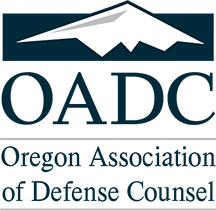 OADC and its practice groups also offer many leadership avenues for those who want to make a difference in the defense practice. There are opportunities to become involved as a practice group leader chair, vice chair, or publications representative. If you are interested in being on a practice group please send an email to [email protected] and list the practice group you would like to join.